The SCV-GSA is responsible for sustainably managing groundwater in the Santa Clara River Valley East Subbasin. The Subbasin is primarily located in the Santa Clarita Valley. Its western limit is near the Los Angeles-Ventura County Line and its eastern limit is generally along Highway 14. It includes the neighborhoods of Castaic, Stevenson Ranch, Valencia, Newhall, Saugus, and Canyon Country. The Sustainable Groundwater Management Act (SGMA) requires local water agencies to sustainably manage groundwater resources. 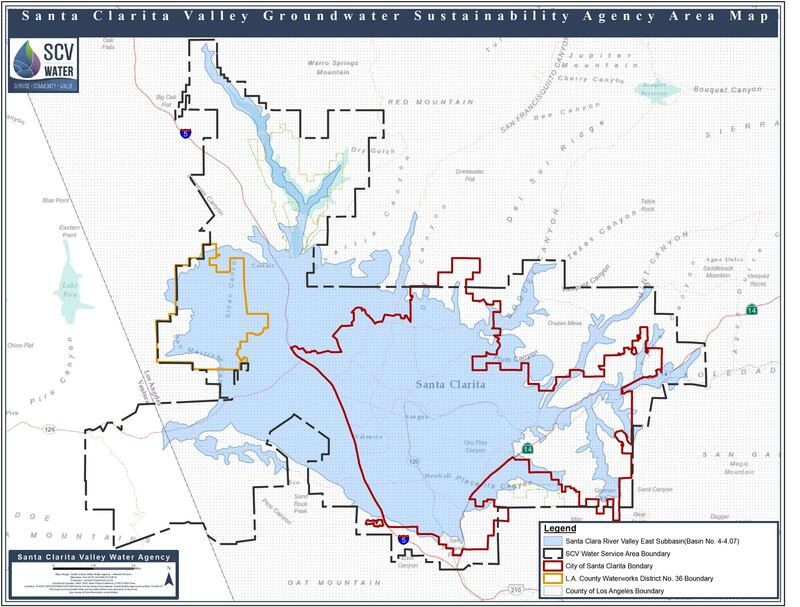 By January 2022, the SCV-GSA will develop a Groundwater Sustainability Plan (GSP) tailored to the resources and needs within our community and a goal to achieve sustainable groundwater management within 20 years. Good groundwater management will provide a buffer against drought and climate change, and contribute to reliable water supplies regardless of weather patterns. Santa Clarita depends on groundwater for a portion of its annual water supply, and sustainable groundwater management is essential to a reliable and resilient water system. The Sustainable Groundwater Management Act (SGMA) was passed in 2014, which provided a state-wide framework for “management and use of groundwater in a manner that can be maintained during the planning and implementation horizon without causing undesirable results.” SGMA requires agencies to bring groundwater basins into balanced levels of pumping and recharge through development of a Groundwater Sustainability Plan (GSP), and reach sustainability within 20 years of plan implementation. The act recognizes this can best be accomplished locally, and directed the formation of groundwater sustainability agencies.